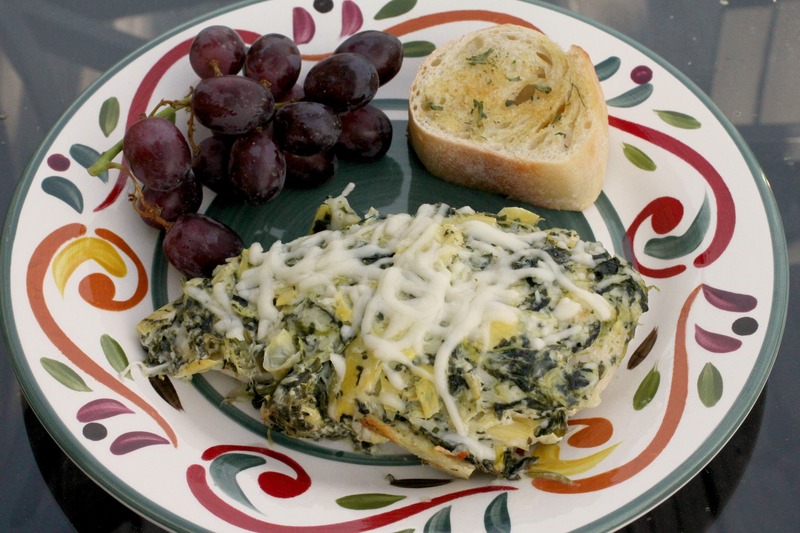 A while back, I posted a recipe for Spinach & Artichoke Dip. It was absolutely divine (and way too addicting), and it inspired me to search for recipes on pinterest using this classic dip. And thus, I found this Spinach and Artichoke Dip chicken. And my goodness, I’m so glad I did! 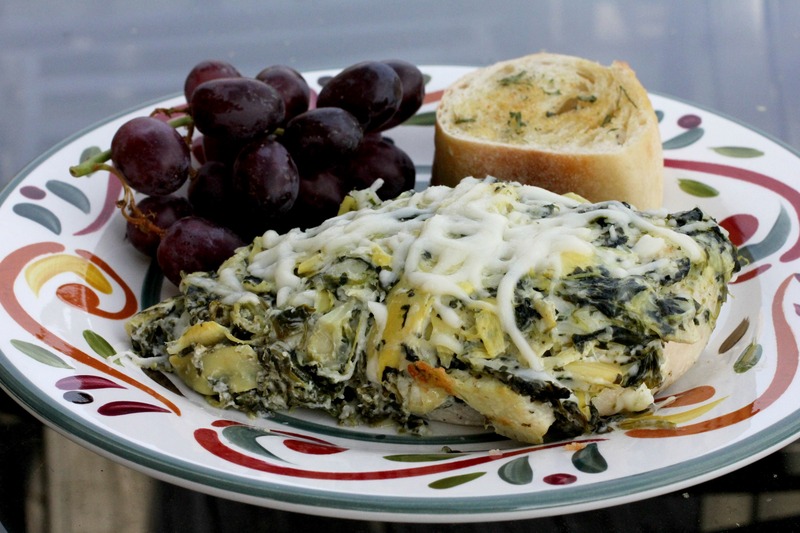 As we all know, spinach and artichoke dip is definitely NOT healthy or good for you in any way. While this chicken still is not something you’d want to eat if you’re watching your weight, it DOES use more health-friendly ingredients like Greek yogurt and low fat mayo instead of cream cheese and sour cream to sort of curb what would be astronomically unhealthy. So it’s nice that you can eat this and maybe not feel so incredibly indulgent. As delicious as this chicken was, I do have one improvement: I think the chicken should be pounded thin. The topping is delicious, but the chicken breasts I used were like 3 inches thick so you’d have lots of chicken bites without all that gooey goody on top. Plus, I think it would look better in the pan for all of the chicken to be flat on the bottom of the casserole dish, as opposed to mounded up like in my first picture above. 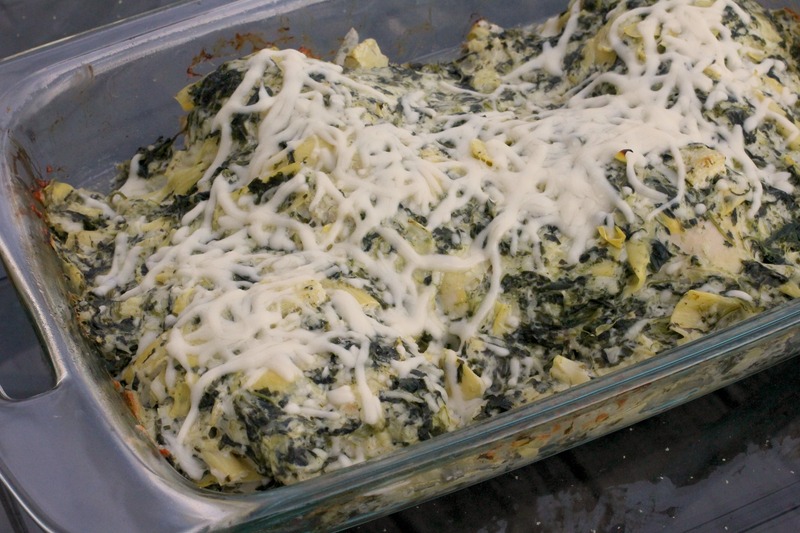 Lastly, make sure you serve this with some delicious bread to sop up all the extra cheesy, spinach-y goodness left on your plate! Place chicken in baking dish. Salt and pepper chicken and then bake 15 minutes. Meanwhile, in a medium bowl, combine all remaining ingredients and then pour on top of chicken. Bake 20-25 minutes or until chicken is done. Let stand about 5 minutes before serving. Thanks Donna! If you like the dip, you’re sure to love it! Eager to try this, but will have to wait until after the holiday weekend. It will be great for any occasion! You will love it!